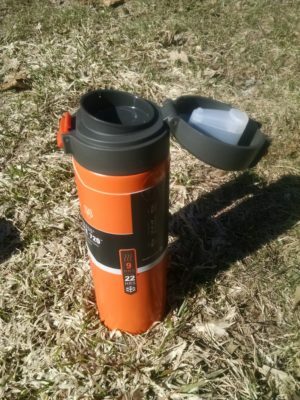 I have long been impressed with the plethora of handy products that GSI has come out with for the outdoor enthusiast, backpacker, hiker, and general fitness minded folk. Their catalog WEBSITE ranges from cast aluminum dutch ovens (of which we own two), to backpacking stoves designed for four season use, to camp furniture and coffee brewing apparatus. They really have it all. I have now been provided two of their new vacuum insulated Microlite bottles. LINK The first I will give specs on is the 720 Flip and the second is the 500 Twist. Incredibly lightweight, vacuum-insulated bottle provides 9 hrs. heat and 22 hrs. cold retention while being 1/3rd lighter than traditional designs. Impossibly thin, 2mm walls are actually thinner than most single wall plastic bottles for an amazingly compact footprint that fits anywhere. 18/8 stainless steel boasts unrivaled purity and durability. Push-button, flip top cap locks closed for transport and locks open for easy drinking. Incredibly lightweight, vacuum-insulated bottle provides 10 hrs. hot and 20 hrs. of cold retention while being 1/3rd lighter than traditional designs. Impossibly thin, 2mm walls are thinner than most single wall plastic bottles for an amazingly compact footprint that fits anywhere. 18/8 stainless steel provides unrivaled purity and durability. Secure screw top cap includes leverage enhancing lobe which makes opening frozen bottles easy- even with mittens or gloves. Leash provides convenient attachment point. I utilized our very accurate kitchen scale and measured the 720 Flip bottle at 10.8oz which is slightly less than advertised. In comparison, I have another major brand similarly sized stainless insulated vacuum water bottle and it weighs 16.4oz, so it appears that the term “Microlite” is valid in this case. I measured the 500 Twist at 8.0oz which is a hair heavier than advertised. My initial thought regarding these thin walled water bottles was that they would be delicate. Upon receiving them I found that one can press their finger against the side wall and it will dent in, but spring right back out! Any other thermoses or stainless water bottles I have ever used first of all couldn’t be pressed in with your finger, and if pressed somehow, they would retain said dent. It seems that GSI has used some sort of “spring” steel which springs back out when hit. This is a great way to reduce weight. I mentioned previously that I have a different manufacturer’s vacuum water bottle and whereas I like it, it is too heavy for me to use it in any other way but around the house, camp, or car. I would not want to heft the weight. 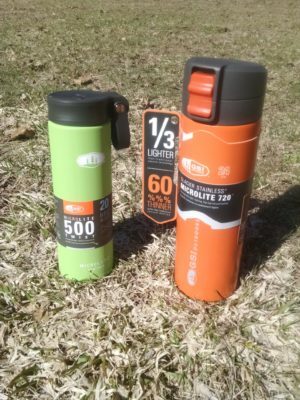 Both of these Microlite bottles are reasonable enough to carry around without being too much of a drag. Upon looking at the specs for both bottles on the website I noticed at the bottom of the page what accessories are available for each bottle. What I quickly realized is the difference between the say, 720Flip and the 720Twist is merely the lid and you can purchase the lid you don’t have or a replacement for a very reasonable price. I can imagine cases where you would want the 720 capacity of a hot liquid but not want the Flip drinking ability but rather have the Twist option. This is a very handy feature to have. Cheers to GSI Outdoors for thinking ahead on this! In the coming weeks I will be testing the Microlite bottles cold and hot retention claims. I am not 100% sure the exact environmental specs they used to come up with their numbers, but I will try and use average interior home ambient temps and basic cold tap water with a few ice cubes and just under boiling water. Stay tuned for my data! I now have been using these water bottles for a month or so. My preference is the 750ml version as it is larger and just gives me more volume before having to refill during the day. I also prefer it because it has the flip lid and is easy to access one handed. The 500ml has the twist lid which is not convenient, but likely much more water tight. I think I will order the flip lid for the 500ml soon to give me that versatility. As to the flip lid, I have found it just a little drippy. It does not leak so to speak, but a little water can get in the cover area and drip out occasionally. The lock on the lid works great. I knocked the bottle off a desk and it stayed totally water tight. I then wondered about what would happen with the lock off and it falling and as expected, the lid popped open when it hit and water leaked out. Fortunately the hole isn’t that large so it didn’t leak terribly fast. So just make sure the lock is engaged if there is any possibility of it falling. I borrowed a laser temp gun to test how well the bottles retain cold and hot liquids. I have not done the hot yet but I did do the cold and the results were good. My anecdotal observations were that if you put a few ice cubes in the 750ml bottle with cold tap water, it stays nice and cold all day and overnight! But to give you the data, at an ambient temp of 68F, the 500ml bottle started at 47F and only warmed 8F in 12hrs. I tested it every couple hours but that gives the big picture. The outside temp of the bottle stayed about 70F the whole time. The 750ml I filled in the late morning with 6 ice cubes and tap water and it started at 40F and I drank about half of it while doing errands. In 12hrs, it only warmed 10F. So these bottles do seem to keep liquid cold for quite a long time while keeping the exterior temperature the same as ambient, which means they don’t sweat! In terms of durability, I have dropped the 750ml bottle a number of times and apart from a little scratched paint and a tiny dent on the bottom corner, it has held up great. These bottles if struck on the side just don’t dent as they spring back. I would say the one thing I wish the flip lid had was some provision to attach a biner or cord or something to carry the bottle with or hang from your pack. The screw top lid has a loop on it which a biner or cord could be attached. At this point I have been using the 720ml bottle daily. I have used the 500ml bottle occasionally at best. Mostly because of the size. I just ordered the flip lid for it though and I suspect I will like it for running out the door for a quick errand. I honestly rarely drink the whole 720ml bottle while I am out. The benefit to that is when I leave it in my truck overnight, the next day it is still ice cold! These bottles keep liquids at the temp started very well. Absolutely no sweating either. The large bottle has sustained some pretty decent drops with no dents staying present. Also, the flip lid cleans easily and does not get mildewy if left out and not cleaned for a while. This is I believe because it is sealed so well that light does not get to where you drink from so mold is not able to grow. Very nice design! So to wrap things up, these are very well designed bottles in terms of weight and temperature retention as well as ease of drinking using the Flip lid. The only criticism I have is that the Flip lid has no loop to hook onto anything or to carry it from like the Twist lid.